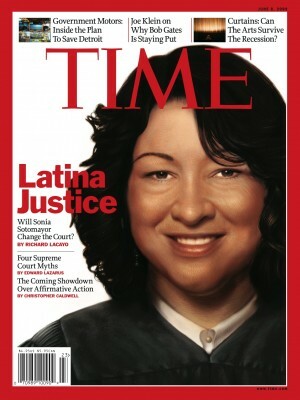 President Barack Obama's Supreme Court nominee Sonia Sotomayor makes her cover girl debut on the June 8th issue of Time magazine, which proclaims the Bronx-bred Puerto Rican the "Latina Justice." Like himself, Obama chose a justice with an extraordinary journey, one from Puerto Rico to the Bronx to the Ivy Leagues of Princeton then Yale Law. “I strive never to forget the real world consequences of my decisions on individuals, business and government,” Sotomayor said in her press conference earlier this week. Making her first official comeback since her debacle with ex-boyfriend Chris Brown, Rihanna (in a stunning bustier and sky-high do) looks radiant as the star of Kanye West's new music video for "Paranoid". While we love that she's trying to put her battered past behind her, we kinda wish she didn't do the manic driving sequence in the end, with the caution sign for "Paranoid Road" in the background...a little too close to reality for us! 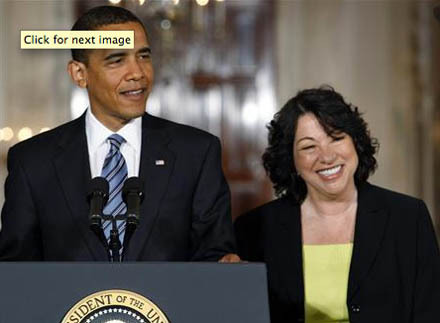 President Barack Obama nominated liberal appeals court judge Sonia Sotomayor to the U.S. Supreme Court on Tuesday, to fill the seat of retiring Justice David Souter. Sotomayer, 54, is the daughter of Puerto Rican immigrants and was raised in New York City's public housing projects. She is most famous for her decision in the 1995 trial that barred Major League Baseball owners from using replaacement players and ending a strike. Her selection to the court would be the first Hispanic justice and the third female. Obama praised Sotomayor calling her an "inspiring" woman said she has "lived out the American dream," in reference to her humble beginnings. "I strive never to forget the real world consequences of my decisions on individuals, business and government," Sotomayor said in the press conference. Even though Blindie already covered the reunion of America's most beloved black family, pre-Obama era, there can never be enough said about the Huxtables. Before Barack and Michelle came on the scene, they were our black royalty... despite being fictional. 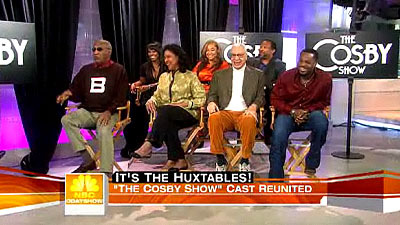 I know we were all supposed to feel all warm and fuzzy seeing the Huxtable clan with Matt Lauer during breakfast, but the whole thing just made me wish that maybe it’s time to stop carrying a torch for The Cosby Show and put some TV shows on the air in THIS CENTURY that feature people of color that are just as progressive. After all, the show debuted 25 years ago! It’s a shame there hasn't been a show to fill the Cosby gap and clearly the networks aren't looking either because they gave us My Wife and Kids, The Bernie Mac Show and Girlfriends. Trust us, nobody will be talking about those shows 25 years from now. If more people watched, we might be talking about The No. 1 Ladies’ Detective Agency. C’mon people! Progress: 100 steps backward. Sadly, boasting about the progressiveness of The Cosby Show for 25 years has reversed all the advancement and social change the show caused in its original eight-year run. It's official hip-hop is the safest most family-friendly mainstream music in America. 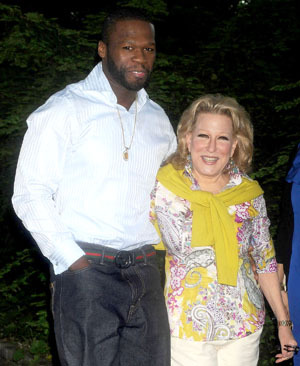 Curtis Jackson, AKA 50 Cent, teamed up with Bette Midler for a second year in a row to help fix a park. What, you were expecting a duet? Maybe Mr. Cent was listening to “Wind Beneath My Wings" when he was recuperating from those 9 gunshot wounds. Hopefully the unlikely besties will collaborate musically! Progress: 97 steps forward. Does Beyonce’s ego prevent her from making another video concept? People like to say that Woody Allen makes the same film over and over again so why does Bey get a pass? I’m not denying her talent (her musical talent), but why are all of her videos essentially rehashes of the same Bob Fosse concept? Boh-ring! Still, watching her dance with two women who aren’t Destiny’s Child always amuses me. Progress: 798 step-ball-changes backward. 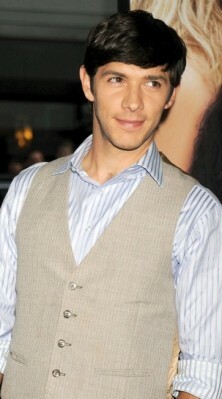 Former 90210 2.0 guest star Jessica Lucas is dropping into the CW's reboot of Melrose Place with some lovely eye candy on her arm: Sisterhood of the Traveling Pants stud Michael Rady! The gorgeous pair play hot couple Jonah Miller, an aspiring filmmaker, and Riley Richmond, a rich girl who works as an inner-city elementary teacher. The show also stars Ashlee Simpson-Wentz, David Cassidy spawn Katie Cassidy, and alums Laura Leighton and Thomas Calabro. See the clip below for previews of the series (fast forward to 1:50 for Jessica and Michael's scene). Ga Ga: Tom Cruise’s Son Connor Is All Grown Up And Hot (So What He’s Only 14)! Photo: Kevin Reece/London Entertainment Tom Cruise and his adopted son Connor were front and center at the Staples Center in downtown Los Angeles on Thursday as the Denver Nuggets beat out the LA Lakers in Game 2 of the Western Conference Finals. The father and son duo sat courtside watching the game intently matching gestures and making quite a handsome pair. Connor who is just 14 years old looks to be growing up fast and quite nicely! Blindie wonders if he will follow in dad's superstar footsteps to become an actor since he's already on his way to heartthrob status.